The Battle of Cunaxa was fought in 401 BC between Cyrus the Younger and his elder brother Arsaces, who had inherited the Persian throne as Artaxerxes II in 404 BC. The great battle of the revolt of Cyrus took place 70 km north of Babylon, at Cunaxa (Greek: Κούναξα), on the left bank of the Euphrates River. The main source is a Greek eyewitness and soldier, Xenophon. 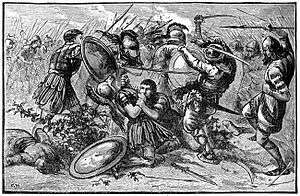 Cyrus gathered an army of Greek mercenaries, consisting of 10,400 hoplites and 2,500 light infantry, and, peltasts, under the Spartan general Clearchus, and met Artaxerxes at Cunaxa. He also had a large force of levied troops under his second-in-command Ariaeus. The strength of the Achaemenid army was 40,000 men. Inversely, Artaxerxes II placed his left on the river, with a unit of cavalry supporting it also. Artaxerxes was in the center of his line, with 6,000 units of Persian cavalry (which were some of the finest in the world and by far superior to anything Cyrus or the Greeks could field) which was to the left of Cyrus, his line being so much the longer. Artaxerxes line overlapped Cyrus' line quite significantly, since he was able to field many more troops. Cyrus then approached Clearchus, the leader of the Greeks, who was commanding the phalanx stationed on the right, and ordered him to move into the center so as to go after Artaxerxes. However, Clearchus, not desiring to do this - for fear of his right flank - refused, and promised Cyrus, according to Xenophon, that he would "take care that all would be well". Cyrus wanted to place him in the center as the Greeks were his most capable unit, and were thereby most able to defeat the elite Persian cavalry and in the process kill the Great King, thereby gaining the Persian throne for Cyrus. Clearchus refused this owing to the insecurity that the Greeks had for their right flank, which tended to drift and was undefended, as the shields were held in the left hand. That Clearuchus did not obey this order is a sign of the level of control that Cyrus had over his army, as a couple of other occasions throughout this campaign prior to the battle reveal also. This is inconsistent with military discipline, even in this day. The Greek senior officers foolishly accepted the invitation of Tissaphernes to a feast. There they were made prisoner, taken up to the king and there decapitated. The Greeks elected new officers and set out to march northwards to the Black Sea through Corduene and Armenia. Their eventual success, the march of the Ten Thousand, was recorded by Xenophon in his Anabasis. ↑ (for the flag) George Henry Preblem, The Symbols, Standards, Flags, and Banners of Ancient and Modern Nations, The Flag Research Center (1980).